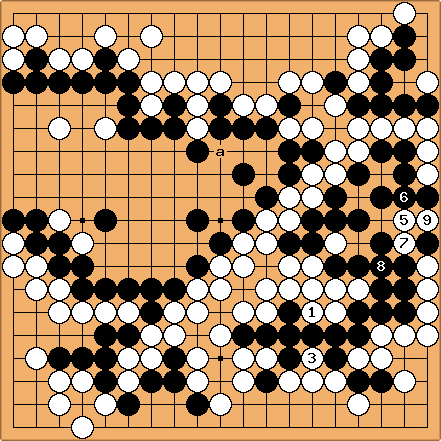 P7A77: I'm currently 11k on KGS and just had a game where my opponent misread a ladder. Usually in such "oh, duh" moments you get a resignation, but the game continued, leaving me with the question that haunts us all: Where to play? I ultimately decided to give myself some potential in the corner, stake out the bottom side, then claim my bounty with . 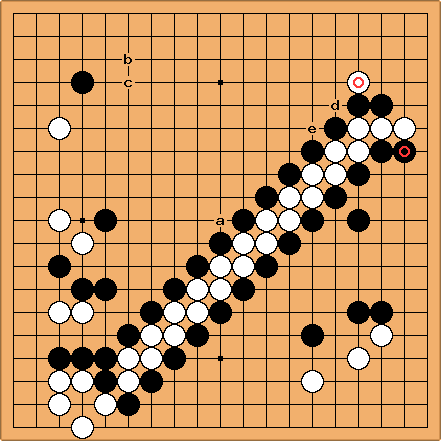 I then got bolder, and after some preparatory moves jumped into the top side, using my surrounded stones on the left as aji. By this point I think my opponent was flustered, so I probably got away with more than I should have. Obviously my strategy worked tremendously, but I can't be sure a lot wasn't psychological. Any suggestions for direction of play from the original position or tips on things to think about in such situations? I doubt this will ever be a factor in a game of mine ever again, but might as well be prepared. P7A77: This was the last area played, and I did look at how to get to , but I figured to pursue it at that point would have been rude, especially since Black was playing cautiously at this point and likely wouldn't have passed twice. It was certainly tempting! 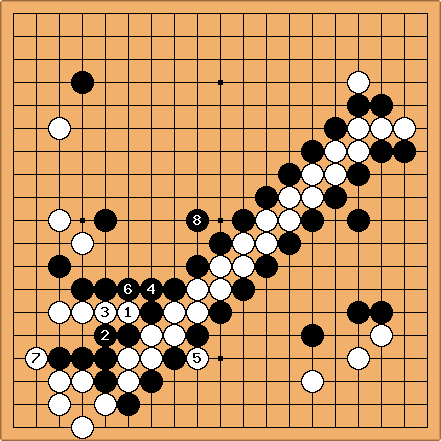 Gul: Black certainly wouldn't have passed twice. He would play and just "lose" a point. Alex: Yes, this is a commonly misunderstood point about etiquette and rules. Firstly, if the opponent doesn't defend inside his own territory where he should have to, once the dame are filled, he is getting (at least) one more point than he should, which can make a difference, though obviously not in this game. Secondly, in games played over the Internet or where there is a language barrier, filling the dame around a group that will eventually need reinforcement is a common way of signalling to the opponent that he needs to fill a point inside his territory and should not be considered rude. Over the board, I've seen people do it that way or verbally, or simply pointing the the point that needs to be filled. P7A77: Very true, it is another point. Perhaps I shouldn't let things like that slide, simply to keep myself in the habit of recognizing where there are points to be had. Since Black should have resigned much earlier, I felt it'd be salt in the wounds. Thinking about it now, over the board the dame would be filled before scoring. I should do that more online, if for nothing else to prevent myself from getting casual about protecting my own groups. unkx80: Not just that. The Black stones in the middle has so bad aji that I think White a can capture at least a Black stone. P7A77: Are you sure about that? I can't see any lines that guarantee a capture. Alex: I agree with unkx80. Black can't resist too hard, or this happens. 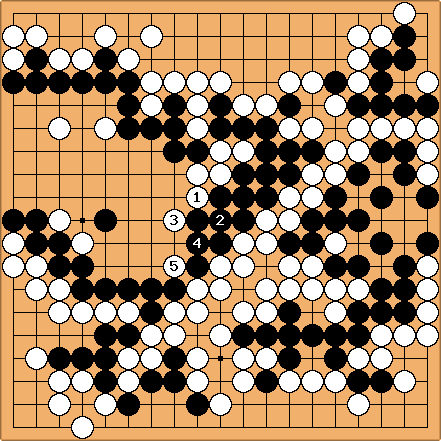 unkx80: Well, I was thinking whether to make this another kyu exercises or tsumego from games problem, but for some reason, I decided otherwise. Anyway, here is another addendum. P7A77: Wow! Sorry for doubting. While I was playing, I had a feeling that cut could lead to something, but I couldn't see it. Very crafty! Would anyone mind if I put it up on goproblems (giving shout-outs to you fine folks, of course)? unkx80: It is okay to question my claims. Afterall, deshis here already know that I have made a number of dubious claims that were subsequently refuted. I have no problems for you putting this problem on goproblems.com. Be aware though, there are a number of correct variations for this problem that can capture something without ko, so please take care to cover all possible cases. ...but eventually White transforms it and joins the other variation. IanDavis: There are so many options! How to find the best one? I suppose for me the top of the board is the most interesting place. 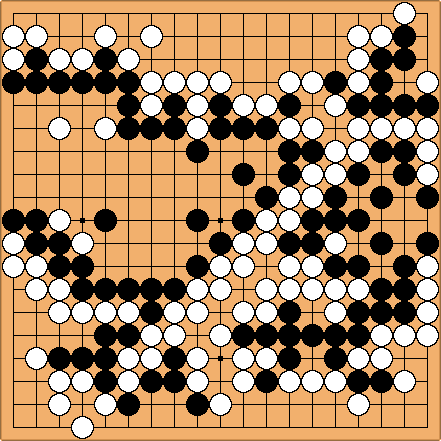 White has pretty settled groups elsewhere and the top right corner is very open skirted. I would consider cutting at around tengen. Cutting at D looks artistic. Follow up at B or C? Bill: My first thought is 'd', to get some work out of . P7A77: Ian, exactly! I know that this situation is 'supposed' to be good, but I was fearful of doing it wrong. A play at 'a' would allow me to just muck everything up. Bill (and Ian), I went to 'e' after the sequence I showed. My stubbornness didn't want to give up that huge bottom left, but the potential for loss up top is much greater, and 'e', while it worked out, was perhaps too greedy had Black decided to play 'd'. Thanks for your ideas, folks. It was such a weird (for me) situation, I wasn't sure if I took full advantage. dnerra: I also think that 'd' is a much bigger cut than 'e'. 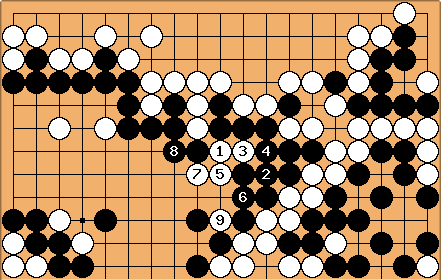 Capturing one of the single stones with 'a' isn't really that big until Black has no chance to close off the center territory anyway. But if you cut off the two stones right to 'd', Black has a problem (or loses a big corner).